With 2017 observing the fastest rate of global growth recorded since 20111, large parts of the emerging world and resource-rich regions have stabilised due to a continued recovery of commodity prices. Coal prices improved by almost 30,0% and similarly, metals prices recovered by more than 20,0%. Stabilisation of commodity prices bodes well for Transnet as the transportation and handling of key commodities such as coal, iron ore and manganese contribute significantly to our bottom line. However, these improvements must be viewed within the context of a series of global economic crises, negative shocks and falling commodity prices between 2008 and 2016. Transnet was not immune to these headwinds, which influenced our projections as they relate to profit and capital expenditure. Notwithstanding these challenges, the global economy appears to have entered a cyclical upswing with the International Monetary Fund (IMF) forecasting global growth of 3,9% and developing and emerging market growth of 4,9% in 2018. Contributing factors to the positive outlook is the expectation that advanced economies will grow faster in 2018 and 2019. Accommodative monetary policy in the Euro area and expansionary fiscal policy in the US are driving favourable projections for those regions. Emerging and developing economies should benefit from continued strong growth in emerging Asia and Europe, and from a modest upswing in commodity exporters after three years of weak performance2. Significantly, global growth is not expected to continue at the same pace beyond the next couple of years. The IMF notes that “while upside and downside risks to the short-term outlook are broadly balanced, risks beyond the next several quarters clearly lean to the downside”. These risks emanate, in part, from trade tensions stemming from inward-looking policies as well as geopolitical strain. At home, national accounts data for the fourth quarter of 2017 surprised on the upside, with a sharp quarter-on-quarter expansion driven by private consumption and fixed investment. In January 2018, manufacturing output expanded for the fourth consecutive month, recording its sharpest increase since June 20163. Indeed, the IMF has forecast South Africa’s economy to grow by 1,5% in 2018, which is an improvement on the 1,3% growth rate of 2017. The country’s forecasted growth rate is still well below the sub-Saharan African region’s average of 3,4%. However, with improving business confidence after a period of political uncertainty, the growth rate is expected to keep improving beyond 2018. It still remains unclear at this stage whether the projected improvements in GDP and business confidence will provide sufficient relief from the effects of the downgrade of the sovereign credit rating of South Africa in 2017. 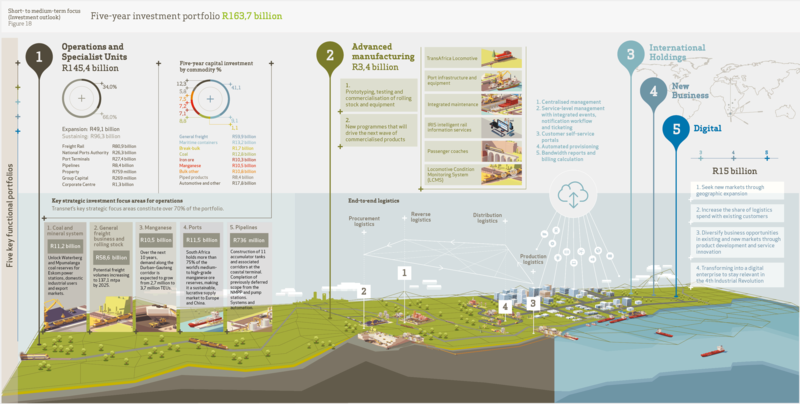 The world, including South Africa, is facing a 4th Industrial Revolution. According to the World Economic Forum (2017) this evolution follows on the digital technologies of the 3rd Industrial Revolution powered by a wide range of new breakthroughs not only in the digital realm (such as artificial intelligence) but also in the physical realm. These new automated technologies bring advanced robotics, new forms of automated vehicles, quantum computing, etc. With the expected global recovery not materialising as anticipated during the MDS period, the Company was compelled to recalibrate and refine its capital expenditure as per the changing market conditions, changing from investing ahead of demand to investing based on validated demand. The 2019 financial year marks not only the conclusion of the original MDS planning horizon, but also the introduction of our new Transnet 4.0 Strategy which, at its core, is Transnet’s response to the emerging 4th Industrial Revolution. This evolving paradigm is characterised by a fusion of technologies and digital applications poised to disrupt almost all industries, while transforming systems of production, governance and management at all levels of the value chain. 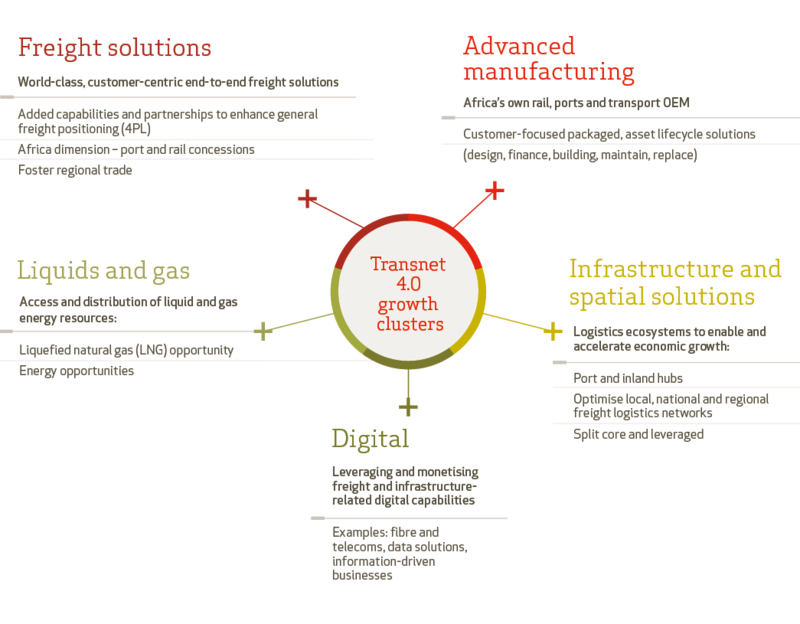 Transnet 4.0 will use the MDS as a base to reposition Transnet for new growth and competitiveness in the fast-evolving, technology-driven context of the 4th Industrial Revolution as we continue to provide capacity ahead of demand. Transnet expects to invest a further R163,7 billion in capital over the next five years to 2023. In 2019 we will see a shift in the balance of ‘sustaining’ and ‘expansion’ capital expenditure – with the pendulum swinging towards sustaining investment. At the inception of the MDS in 2013, this split was ‘expansion’ at 58,0%, versus ‘sustaining’ at 42,0%. The capital expenditure split is now expected to shift to 34,0% and 66,0% respectively in the coming financial year, which will result in more effort being placed in maintaining and enhancing current operations. 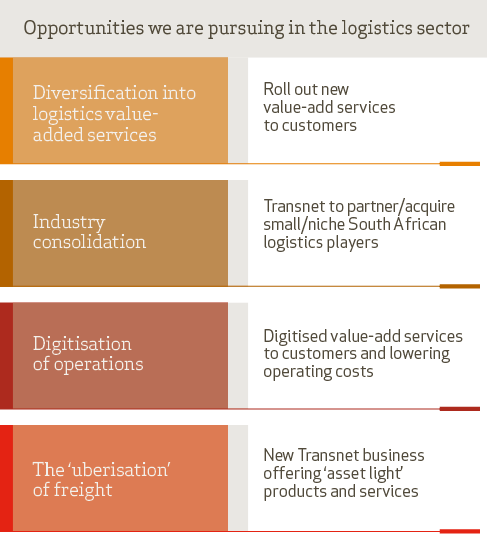 While our primary focus remains volume growth of the core business in the long term, Transnet is also seeking new growth paths to compensate for low-growth expectations and instability in its traditional market segments. Accordingly, organic growth of the current freight transport and handling divisions will still account for the bulk of this growth as we target improved connectivity, density and capacity of an increasingly integrated port, rail and pipeline network. The accelerated development of logistics and industrial zones, centred on intermodal terminals, will be a key component of this, providing critical infrastructure to complement and feed the network. In tandem, we will improve operational efficiency and reliability, and innovate around new revenue streams to grow market share in both domestic and regional markets, particularly in integrated logistics, the development of logistics hubs and clusters, natural gas midstream infrastructure, manufactured products and digital businesses. Private sector partnerships will be a key enabler and driver of these new ventures. Going forward, the success of Transnet 4.0 will, in great part, depend on our ability to create new revenue streams that leverage Transnet’s digital capability, expertise and platforms to deliver technology and business solutions for the African market, firstly for the regions of East Africa and the South African Development Community (SADC) region, and later extending to the greater sub-Saharan African region. Again, strategic partnerships and collaborations with sector specialists in the freight logistics environment will accelerate new business ventures and new revenue growth. We have considered several megatrends in the transport and logistics industry sector, together with risks and opportunities. 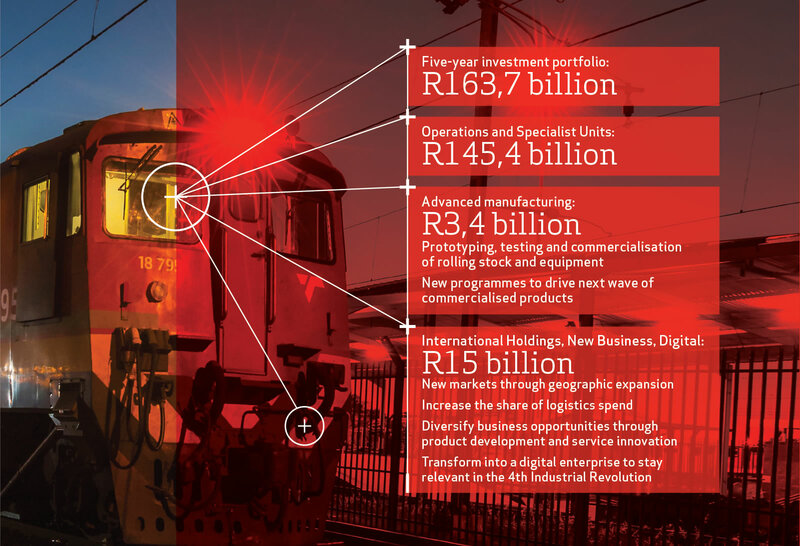 As we embark on Transnet 4.0, we will need to balance our investment in traditional infrastructure, such as rail, pipeline and ports, with our investment in other revenue-diversification opportunities, as well as technological innovation and digital enablement within our operations. 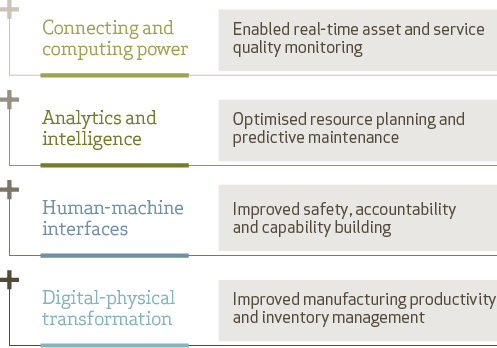 Figure 17 outlines this perspective as we transition from the current functional portfolios of the remaining MDS horizon in the short term, towards greater focus on our advanced manufacturing business, as well as our growth aspirations through geographic expansion, new markets and digital innovation within the logistics value chain. Overall, the short-term global economic outlook is positive. We are cautiously optimistic that the South African economy is in steady recovery and with it, our domestic business outlook. However, the sub-investment grade economic climate in South Africa is negatively impacting the general level of liquidity in the debt markets. Transnet has identified several measures that could be implemented to mitigate a potentially constrained funding scenario. By way of example, this may include reducing capital investments in the short term by prioritising and optimising capital projects, cost-containment initiatives, operational efficiency improvements and securing diversified and new revenue streams. Capacity creation remains a strategic fundamental for Transnet, both in terms of our own competitiveness and in contributing to wider economic growth. As a State-owned Company, Transnet will continue to play its role in creating transport infrastructure capacity as well as maintaining and improving the reliability of existing services to contribute positively towards a growing and inclusive economy. Going forward, Transnet 4.0 aims to mitigate our exposure to ‘boom and bust’ cycles in commodity markets through diversification and product innovation, and also chart new growth paths that are sensitive to the realities of an operational landscape that is modernising at an accelerated rate.